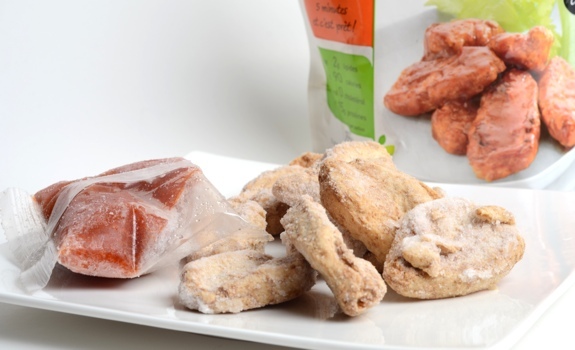 Vegetarian chicken wings, in their frozen state with a pack of rock-hard buffalo sauce. Now, correct me if I’m wrong, but isn’t the whole point of chicken wings the bones? The amount of work necessary to pick away every last strand of meat from the bones always struck me as a waste of time and effort, but that silly inefficiency defines the wing-eating experience. The journey, not the meat-to-effort ratio, is the reward. So, what would happen if you eliminated the bones entirely? “It’s been done,” you say. Google “boneless wings” and you’ll find countless examples of breaded nuggets of chicken breast, coated in sauce, then sold at restaurants as wings, minus the bones. These are, of course, hardly chicken wings. But what if you took the next logical step down the slippery wing slope? What if you eliminated not only the bones from the chicken wings, but the meat as well? What would you have then? “Vegetarian chicken wings?” you say, scratching your head. “A lump of batter and sodium-laced sauce?” says someone else at the back of the room. “Uh, the former,” I reply, smiling politely. They come frozen, under the Gardein brand, in packs of 10 “wings,” and were on sale for 4 bucks a bag at Planet Organic last month. The package says the ideal way to cook them is to pan fry, but my apartment kitchen’s ventilation situation prevents me from giving that a whirl. Instead, I followed the oven directions, tossing all 10 frozen wings in the included hot buffalo sauce, spreading them out on a foil-covered metal tray, and baking them for the suggested 17 minutes. Is there a way to say this nicely? No there isn’t. These things are terrible. Why? Well, let’s start with the texture. It’s not tender but rubbery. It doesn’t pull away in strips like real chicken. It’s like biting into a piece of cooked extra-firm tofu. Or the sole of a sneaker. Yuck. I’m not sure what these things taste like – soy protein, maybe? – but it sure as hell ain’t chicken. There’s a characteristic soy twang that leads to, um, more soy? A little fermented flavour in there, too. Even the sauce, which could potentially save these things, isn’t great. It’s passable, but it could – and should – be a whole lot better, especially if the goal is to mask the nastiness of the soy base. Every sports-bar chef this side of Accra knows that the sauce makes or breaks chicken wings. Why wasn’t that basic lesson applied here? They’re not going to replace regular chicken wings for meat eaters (one bite will be enough to quash that notion), and they’re not going to impress vegetarians, either. In short, nobody wins. Expect these to vanish shortly. Gardein vegetarian buffalo wings, prepared and slathered in sauce. In plain speak, rubbery lumps of soy and wheat protein, bathed in mediocre buffalo sauce. Ick. Cost: $4 on sale at Planet Organic. Value for cash money: Not bad, unless you consider the taste. Availability: Health/natural/organic food stores. Maybe the vegetarian freezer in a well-stocked supermarket. Nutrition? : Shockingly low-cal, all things considered. The package says that 4 pieces contain 90 calories, which works out to 22.5 calories per piece, or 225 calories per 10-piece bag. That doesn’t include the sauce, which has 10 calories per tablespoon. Tons of protein, and a whole lot of vitamin fortification. The verdict: Ick. The taste is awful, so the solid nutritional value is the only worthy selling point. Interesting idea, but the execution is hopeless. I ate 5 of the 10, then gave up. A second opinion from local vegetarian @BenGelinas: The fake buffalo wings tried hard to hide the slightly-chemical flavour of the fake meat with spicy sauce. But I wasn’t buying it. And I won’t buy this product. 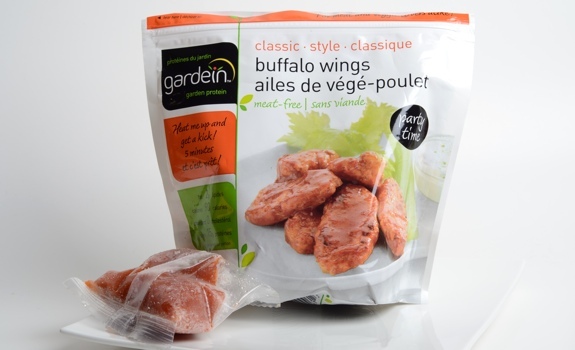 The package for Gardein vegetarian buffalo wings looks good enough, doesn't it? Shame about the taste. Hey, that worked, I am no longer hungry! Ew. Nasty. And yes, the point of wings is the bones. Well, being a vegan myself, when I first tried Gardeins’ products I was a little grossed out, but after being vegan for a few months, you actually begin to get used to and even appreciate the flavor and texture of these fake meats (strange I know). Most of the time though I make my own sauces and seasonings when I eat them, then I can do a better job of masking their “Unique flavour”! thanks for the review this is find. 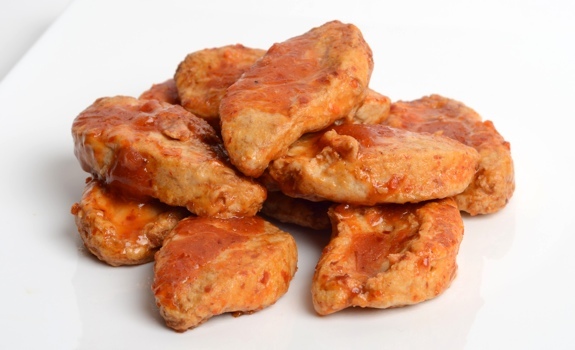 regarding fake meat / fake boneless wings ‘ick’ that is all…..
I’ve found all of the Gardein products to have that weird rubbery texture and less than the best taste. They have recently come out with mock fish that I kinda want to try, but I don’t have very high hopes for it. I already have a tofu based veggie ish recipe, but a good ready to cook substitute would make it a lot easier. For people looking for good vegetarian hot wings, here’s what I like to do: I buy Quorn brand naked “chicken” cutlets, warm them in the microwave enough to be able to cut them into strips, then dip them in almond milk and then a breading mixture of flour and breadcrumbs plus spices, then fry them. When they are done, I toss them in store bought buffalo sauce. They are really good in my opinion and are also well liked by my omni family members. They have a great texture, the closest to meat I have tried.